Zion Market Research has published a new report titled “Food Anti-Caking Agent Market by Product (Calcium Compounds, Sodium Compounds, Magnesium Compounds, Microcrystalline Cellulose, and Others), By Application (Seasonings and Condiments, Bakery, Dairy Products, Soups & Sauces, and Others): Global Industry Perspective, Comprehensive Analysis and Forecast, 2017– 2024”. 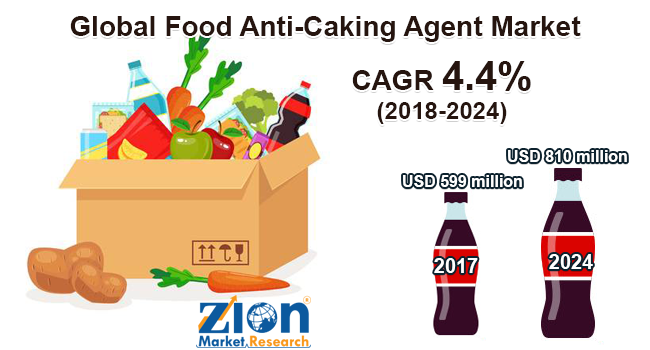 According to the report, the global food anti-caking agent market was valued at around USD 599 million in 2017 and is expected to reach approximately USD 810 million by 2024, growing at a CAGR of around 4.4% between 2018 and 2024. Food anti-caking agent is used as an additive, added to powders or graduals in order to prevent forming lumps. They are used in packaged food & beverage products, road salt, cosmetics, and feed & fertilizers to prevent the formation of lumps. Food anti-caking agents are used in food products such as table salt, milk powder, sugar products, floor, and spices. They absorb moisture or create a coating on the food particles in order to avoid the lump formation. Food anti-caking agent doesn’t have any nutritional value. The food anti-caking agent market is anticipated to witness substantial growth within the forecast period. The market is mainly driven by increasing food and beverage market and increasing adoption of packaged food products by consumers. Moreover, increasing demand for good quality food products is likely to impact positively the global food anti-caking agent market over the next few years. However, increase in food safety norms by European Food Safety Authority may restrain food anti-caking agent market. In addition, some studies have shown that food anti-caking agent may cause additional degradation of vitamin C in food products. On the basis of the product, the market can be classified into calcium compounds, microcrystalline cellulose, sodium compounds, magnesium compounds, and others. Calcium compound is dominating the segment attributed to its high functionality and suitability in the formulation. The market can be segmented on the basis of application as seasonings and condiments, bakery, dairy products, dairy products, soups and sauces, and other applications. Seasonings and condiments segment is the fastest growing among other segments due to change in consumer’s taste and innovation in food products. In 2017, Europe emerged as a leading region in terms of food anti-caking agent demand. The growth is mainly due to increasing food demand for packaged food and changing lifestyle. Moreover, increasing demand for good quality of food products and increasing awareness regarding the nutritional value of packaged food product is anticipated to boost the demand for food anti-caking agents in Europe. North America is another key regional market and is expected show significant growth in the near future on account of increasing demand for convenience food, technological advancement, and product innovations. The Asia Pacific is projected to be the fastest growing food anti-caking agent market owing to growing adoption of western food habits and nutritional supplement industries. Moreover, the growing middle-class population and urbanization are increasing the consumer base for good quality packaged food products and powdered nutritional supplements in countries such as India, China, and Japan. The Middle East and Africa region anticipate experiencing stable growth in food anti-caking agent market due to increasing demand for premium food products, bakery, and confectionery food products. Some of the leading companies have been investing in technological advancement, product innovation, and maintaining grade standards in order to retain their dominance in the market. Some of the key players operating in the market are, PPG Industries, Inc., Agropur Ingredients, Evonik Industries AG, Brenntag AG, Solvay S.A., Huber Engineered Materials, Univar Inc., International Media & Cultures, Inc., Sweetener Supply Corp., PQ Corporation, and others.